Daily wager Bijendra Sao is fussing about at Exhibition Road in Patna to shop for his daughter’s dowry. The doting father wants the best that he can afford—a solar panel that can power two compact fluorescent lamps (CFLs) and a table fan. What better gift to give in a state that suffers perpetual power crisis. And what better place to shop for but the world’s biggest off-grid solar market that does an annual business of Rs 500 crore. Sao is spoilt for choice here. This one-kilometre road has numerous narrow bylanes that cater to the energy needs of people with all pocket sizes. Solar lanterns and streetlights, besides panels of all makes and sizes, are hoarded in matchbox-sized shops. A 75 watt panel can cost from Rs 2,500 to Rs 10,000. After half an hour of hectic negotiations, Sao pays Rs 3,200 for a 75 watt panel that has a two-year warranty. He is lucky, for a warranty is hard to get with underwatted panels. These do not give as much power as they promise. A 75 watt panel of a standard brand would have cost at least Rs 7,000. The flourishing solar market is the result of a grim reality Bihar faces. The state needs 3,500 MW, but supplies only 1,595 MW through self-generation and by procuring it from other states, says Rajmohan Jha, deputy director of Bihar Renewable Energy Development Agency (BREDA). The shortfall makes the state a perfect market for off-grid energy products, he adds. “Bihar gets 300 days of good sunlight in a year. It has off-grid photovoltaic potential of 7,300 MW,” says Sudhir Kumar of World Institute of Solar Energy (WISE), a non-profit in Pune. No wonder, Bihar has quietly replaced the expensive diesel generated power option with solar energy and become the third largest solar user in the country, according to Census 2011. The state government, however, has shown little interest in encouraging solar energy and has never initiated a programme for rooftop off-grid solar power. In 2011, it formulated a renewable energy policy which approved 175 MW grid-connected solar projects. But the policy has no clarity on off-grid solar. “This is why few entrepreneurs have shown interest,” says Harish K Ahuja of Moser Baer, solar panel manufacturer. No work has been initiated under the Centre’s Remote Village Electrification Programme which started in 2004. The programme promises its beneficiaries subsidised rooftop off-grid solar systems. “If government has a programme that promises subsidised solar equipment, people with low purchasing power will not have to buy underwatted equipment,” says Ahuja. Trying to compete at the thriving Exhibition Road market, companies are taking solar equipment closer to villages. Every block in all the 38 districts of the state has its own small Exhibition Road, says Ramadheer Singh, retailer at Jandaha block in Vaishali district. 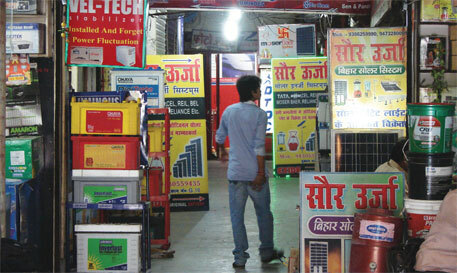 Every shop, be it for clothes or stationery, also stocks solar equipment. “Panels manufactured by TBP are the cheapest and sell the most, despite being underwatted and without warranty,” says Bachchu Singh, retailer at Jandaha. A 75 watt TBP panel, the name of which sounds similar to that of the well-known Tata BP, may give only 30 watts power. Yet, it gives tough competition to Tata BP that offers a 20-year warranty. “I don’t care if the panel gives me less power than it promises. It suits my pocket and I get as much power as I require,” says daily wager Saroj Kumar, living in Jagdeeshpur village in Vaishali. 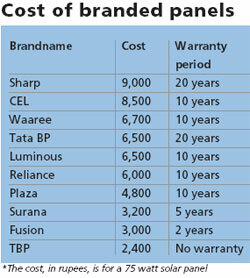 A good quality panel is beyond his reach (see ‘Cost of branded panels’). Earlier, Saroj used to pay Rs 100 every month for a diesel generator to illuminate a 10 watt CFL for four hours and to charge his mobile phone. This works out to Rs 83 per unit, perhaps the highest per unit energy cost in the country. At present, Saroj’s panel is working well. But not all have such happy stories to narrate. When Rakesh Rai bought a cheap solar panel in Jagdeeshpur for Rs 3,500 a year ago, it could illuminate a CFL and at times a table fan. Six months later, the CFL gives dim light for not more than an hour. “The panel is not charging properly,” he says. Rai is back to using kerosene for light that costs around Rs 200 per month. “I cannot complain because I bought the panel knowing it was of poor quality,” he says. 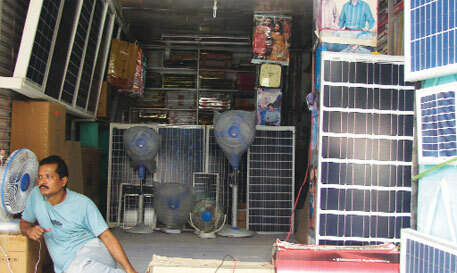 Solar market in Bihar is flooded with underwatted panels made in Hyderabad and Mumbai. “We tell companies what we need—cost, wattage and warranty years. We can choose the brand name. It could be your name, for instance,” says a dealer requesting anonymity. Hyderabad-based Surana Ventures is one such company, he says. Incidentally, the Ministry of New and Renewable Energy (MNRE) has accredited Surana Ventures to make panels under the Jawaharlal Nehru National Solar Mission. Fifty per cent of the state’s solar market is captured by those who make inferior equipment. A retailer in Patna can sell 50 cheap panels even on a bad day. In the past five years, Tata BP’s monopoly over the solar market has dropped by almost 70 per cent, says Piyush Agrawal, dealer at Exhibition Road. “Consumers are being openly duped. If they know that a 75 watt panel gives only 40 watt power, they will buy a good quality 40 watt panel at almost the same price, and it will even have warranty,” says Agrawal. “In villages, retailers push for underwatted panels because they get high profit margins,” says Amrendra Kumar, senior sales executive ate Tapan Solar Energy Pvt Ltd, a Delhi-based solar manufacturer that sells equipment in Bihar. Bad experiences with solar power can lead to the misconception that solar energy is faulty, fear some renewable energy experts. “This may affect its acceptance in future,” worries Manish Ram, renewable energy analyst with non-profit Greenpeace India. It recently released a report that presents Bihar as a model state for decentralised renewable energy systems. Ram says government should ensure that all panels adhere to the standards set by MNRE. “But the standards apply only to panels supplied under government programmes. Thus, we have no control over the market,” says a BREDA official on condition of anonymity. Those who have the money buy good quality panels. Raj Kumar runs a confectionery shop from his house at Salha village in Vaishali. A year ago, he bought an 80 watt Luminous panel with a 10-year warranty for Rs 6,000. It lights a 15 watt CFL in his shop and two 10 watt CFLs and an 18 watt fan at home. “It is good to buy panels with warranty. At least I can get it replaced if it stops functioning. It also gives the promised power,” he says. Power shortage in the state has worked to profit some others. Jagdeep Kumar of Araria village in Vaishali is not very rich. He thought of a novel idea that could earn him some bucks. After saving money for two years and borrowing some from friends, he bought six 80 watt Tata BP panels and created a small grid on his rooftop. The grid brightens up the lives of 50 households every evening. For four hours, each house can light an 8 watt CFL. Jagdeep charges them Rs 75 every month. He expects to recover the Rs 1 lakh installation cost in about five years. At present, what Bihar desperately needs is a strong policy push that provides off-grid energy solutions, says Kumar of WISE. Without it, cheap solar markets like the one at Exhibition Road are the only hope for the power-starved state. Good or bad, it’s what people in the state have learnt to depend on. Indeed a commendable story and the author needs to be complimented. It is time for the state agencies to set the protocol right for this non-renewable energy source without much witch hunting and burden shifting. If a garment seller sees a business opportunity in hoarding/diversifying (to) solar panels, certainly the protection of consumer interests must prevail upon the concerned officials into actions--'Jago Bandhu Jago' on the lines of 'Jago Grahak Jago'. Sale of substandard material/products in the first instance should not be encouraged at any cost. Surely, there is absence of transparent standards in this particular segment and it becomes gravely serious for public agencies to step in to restore credibility. On a different note the state government could also install solar panels on their own buildings and installations with quality equipments to show case more serious concerns about energy security and alternative credible pathways. I have heard that Husk Power Systems are also doing a good job in providing off grid power solutions to people in bihar. The power crises (16-31 Aug 2012: Out of option)usually confined to summer has become common throughout the year. This reflects that the action plan for the POWER based on the needs of the people, industries, farmers, business and other areas is not matching. This lead for the present DARK DAYS with lower production, loss of earnings, and poor health care. Knowing the advantages and limitations of Thermal, Hydro, Gas / Bio gas, and Nuclear based power generation,certainly the SOLAR is the only powerful and environmentally friendly power source. This article has brought out the initiatives made to over come the power crises. The need of the hour is to encourage for the research in designing the cost and power effective systems and to transfer the same to the people through matching supports / schemes. The services of Civil Societies can be used for effective implementation with better utility in respect of power, cost and health.